Convenient, nice to know going into trig, time-saving...especially for the SATs and GREs. 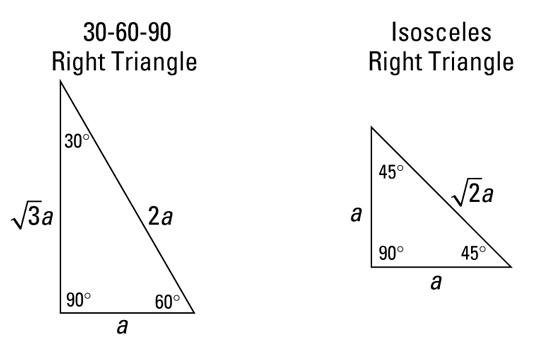 It's a little hard to believe just how much the College Board hearts it some special right triangles. But still, hard to motivate. Enter...the humble dollar bill. It's a rectangle. What sort of rectangle? Not all rectangles are the same shape, of course. Some are squares! Their sides are in a 1:1 ratio. Some are square-like. Some are long and skinny. A long, skinny one's sides might be more like 10:1 or even more severe. What about our paper currency in the US? All denominations are the same size and shape. This is not true in every country. But ours are all this very familiar rectangle. Now we do a little folding. I handed out photocopies of dollar bills. They were black and white, and one-sided, so I don't think it was a felony. At this point, you can also gently unfold it and coax it into a tetrahedron. Don't see it? Look at the creases. and come on, that was no accident. I bet the Freemasons were involved.